reduce costs, protect the crop, and increase yields. During his work, he found out equipment is a major expense on cotton growers’ operations, including the infamous cotton picker. Today’s price tag for a new round bale picker or a square bale module picker is in the $750,000 ballpark; which is exorbitantly high. With new pickers, you need just one or two people and one machine to harvest the crop. This allows the grower to accomplish multiple tasks in a single pass. It’s a tremendous cost savings for growers, Norton said. Norton points out the latest pickers eliminate the need for multiple buggies and module builders to service oneolder standard picker and its fiber load, and theemployees to operate it. New systems allow growers to focus their employees on more important and timely tasks. Another benefit of ‘all-in-one’ pickers is the operational speed. Older pickers traveled down cotton rows at a snail’s pace from 2 to 2.5 miles per hour (mph). Today’s pickers about double this with a 5 to 5.5 mph picking speed, covering more ground in less time, which saves the grower money. New picker benefits and other technology are changing the harvest landscape in Arizona and across other cotton-growing areas. 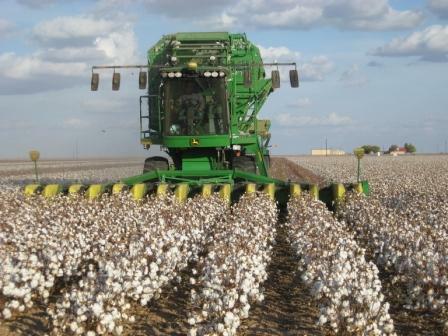 With higher picker costs, more producers are shifting to custom harvested cotton. In southeastern Arizona’s Cochise County, about 75 per cent of the cotton is now custom harvested. As far as crop protection is concerned, Arizona cotton farmers used to spray an average of 15-plus times per season to control a handful of different pests. Today, the average is less than two sprays per season. Norton added that today’s transgenic cottonseed technologies combined with specific targeted insecticides have really made insect control much more efficient today. Advances in irrigation continue to improve water use efficiency in irrigated Arizona cotton. Norton estimates consumptive water use in cotton is about 40-45 inches per acre. With lower irrigation efficiencies, it may take up to 60-65 inches to meet the demand and also manage higher salinity levels in the soil. Cotton can withstand electrical conductivity in the soil up to 7-8 decisiemens per meter before you see yield decline. It’s a very salt tolerance crop. Different growing stages of the cotton plant are more sensitive to salt, including seedlings. To combat salt, many Arizona growers use alternate furrow irrigation to push salt across the seed row. In Buckeye located west of Phoenix, cotton is planted dry and then irrigated up every other row to push the salt line across the seed row. Most Arizona cotton fields use a furrow-flood type irrigation system with more than 50 per cent water efficiency, and reused tail water on another field. The maximum efficiency for this irrigation system is about 70 per cent. In sprinkler and drip systems, water use efficiency tops out at about 80-90 per cent efficiency. In the Coolidge area of Pinal County, many growers are flooding cotton on the flat without furrows. They can flash water more quickly on the field to gain higher water use efficiency.